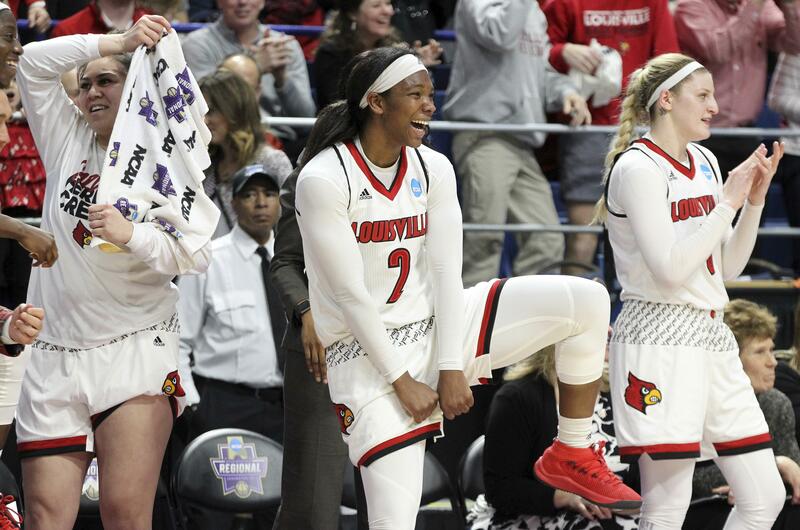 UPDATED: Sun., March 25, 2018, 9:33 p.m.
LEXINGTON, Ky. – Asia Durr scored 18 points, Myisha Hines-Allen added 16 and top-seeded Louisville earned its first Final Four berth since 2013 with a 76-43 rout of No. 6 seed Oregon State on Sunday in the women’s NCAA Tournament Lexington Region final. Playing its first regional final in four years, the Cardinals (36-2) never trailed in rolling to their 11th consecutive victory. They outscored the Beavers 28-12 in the third quarter to break the game open and complete their run through the region by an average margin of victory of 27.5 points. Sam Feuhring had 14 points and Arica Carter 10 for Louisville, which shot 48 percent. Players celebrated on the court before its red-clad following that traveled just under 80 miles east and hung around to watch them cut down the nets. The No. 6 seed Beavers (26-8) struggled in their bid of adding Louisville to their remarkable run of upsets after previously ousting No. 3 Tennessee and No. 2 Baylor last week. Oregon State outrebounded Louisville 32-29 behind 6-foot-5 Marie Gulich (14 points, eight rebounds), but shot 35 percent in losing just their second game in the past 12. Published: March 25, 2018, 9:23 p.m. Updated: March 25, 2018, 9:33 p.m.